Not bad, eh? “Traditional,” my daughter commented. I didn’t pay her any mind. It’s the best carved pumpkin we’ve probably ever had! My husband Dan deserves the credit for the carving (based on a drawing we found online under “pumpkin faces.” Thank you, internet!). Somehow I was able to cajole him into doing it, while I stood by and watched. Is this ever the way to go–carving that baby the weekend before! 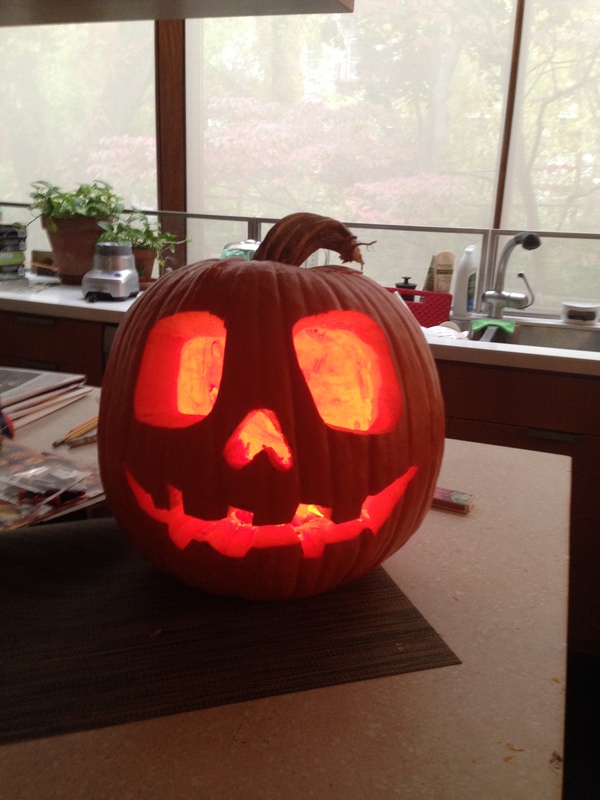 So much more enjoyable than the the routine established after the kids lost interest in the pumpkin (and Halloween decorating in general): I’d put off the carving until Halloween day, until about, oh–an hour before the trick-or-treaters were due to arrive. The pumpkin, after a few weeks’ on the stoop, would be old and tough and resistant to the tiny saw from the pumpkin carving kit. I’d default to the most basic pumpkin happy face, the one with triangle eyes and the gaping grin. Then I’d rush, rush, rush to throw a witch’s wig on, spread black makeup on my face (if I have time, black wax on my teeth–it really freaks kids out) and dump the candy into the big ceramic bowl that only comes out on Halloween. I sound like a pathetic whiner and procrastinator, don’t I? No more whining, from this day forward. Because now my talent husband’s in charge of the pumpkin. “Honey, you did such a good job last year, you have to do it again,” I’ll say this time next year. And he’ll have to agree.